After using Harford’s Heart for the first time to promote Upper Chesapeake Health’s spring event schedule, we received numerous calls from people stating they saw our ad in this publication. We are very pleased with the service and response we have received from Harford’s Heart and look forward to many more successful campaigns with them! Harford’s Heart magazine is the best thing that ever happened to downtown Bel Air! Wow! Just got the mail, and saw your wonderful article in Harford’s Heart—thank you, on behalf of small business owners everywhere! Each voice out there makes a difference. I love the way you’re continuing to move forward with the Project, featuring stores you don’t want to see disappear while shining a bright light on those who are actively supporting the Project. My guess is that the added visibility just might be the ticket to getting more brick and mortars involved. Well done! Harford’s Heart has been wonderful to work with. The staff is friendly and helpful, the magazine is a quality piece from the material its printed on to the content in it. I’ve been thrilled with the expanded customer base I’ve received from it. Having been able to write a couple articles in it has allowed me a way to show existing and potential customers what Belle Patri Home Furnishings &amp; Accessories is as well as the expertise we can offer them. Harford’s Heart is one of my best means of advertising! Your team was extremely personable while maintaining professionalism along with being very easy to work with. Harford’s Heart is a wonderful, informative magazine for our community and does a great job showcasing all that our county has to offer. We have been advertising with Harford’s Heart for almost a year now, and have been very pleased with the response. As we are a new Physical Therapy clinic, we have tried several different avenues for letting people know who we are and what we do. I can honestly say that we have had numerous patients tell us that they first learned of us through Harford’s Heart. Advertising with this magazine has definitely paid for itself, and it is highly recommended. From the very first issue, customers have come into our shop – with the magazine in hand – asking for the items advertised. We’ve never had this kind of response to advertising in other publications! Harford’s Heart has directed more people to our store with every issue. Since we started advertising in Harford’s Heart, we’re seeing more people at the Farmers’ Market each week and many of them tell us they saw our ads. Harford’s Heart is the only place to get the complete lowdown on all the great things that are happening around Harford County. Everything is right there in one book, well organized and easy to find, whether it’s cool little shops, pubs, concerts, movies, places to eat or arts events. It makes you realize how much good stuff is happening so close to home. I never miss an issue. Have you visited Two Sisters Gallery at 328 South Main Street? Many people who visit us report they found us through Harford’s Heart magazine. Their innovative advertising not only directed people to our location but also offered a visual sampling of the many talented artisans in our gallery. From the “calendar of events” to the dining &amp; shopping guides, Harford’s Heart is a much-needed resource for what is happening in downtown Bel Air. 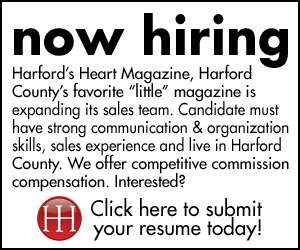 Advertise in Harford’s Heart and you’ll get results. 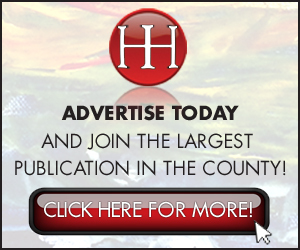 We have enjoyed Harford’s Heart for many years both as a readers and advertisers. We always look for it in specialty shops and restaurants. The magazine is full of information on what is going on in Harford County. The layout and bright colors make the magazine very attractive. Last year, my daughter and I opened a fashion boutique called The Pink Silhouette in downtown Bel Air. We met with Fran, the owner of Harford’s Heart to put in our first ad. She was wonderful. She not only placed the ad, but also helped get the word around town about our business. Our opening day was packed. Customers keep the magazine for months to refer to events. This means that they see our ad often. What comes across most in Fran and her magazine is her enthusiastic love of Bel Air and Harford County. The reader can sense this just by reading the magazine. Copies of Harford’s Heart magazine go really fast – when they’re not here, people ask for them. We can’t keep them in the store. It is with the utmost joy I read your publication. I enjoy skimming it back to front and then settling down and reading it front to back. I was delighted to learn that your publication will increase to six issues beginning this summer. Furthermore, I like the change to the more cultural side of our community. Kudos to a job well done over the past four years! I’m looking forward to the next four years and the directions this magazine will be traveling. As a non profit we love advertising in Harford’s Heart they have supported us for the last several years and are great about getting our events out to the community! I am amazed at the results that Harford’s Heart Magazine has given us. We have enjoyed a record breaking month and half so far because of your hard work. I am still astounded with the way it keeps giving week after week . . . Thanks again for your hard work and extra effort. We really appreciate it. Looking forward to the next addition. I love reading Harford’s Heart, so it made perfect sense to advertise in it. We’ve had a tremendous response to our recent ad for our farm CSA. From the day the publication hit the street, it has continued to direct new customers to us and our website on a daily basis. Their staff took time to design a great ad that really focused our message. Harford’s Heart does a great job taking care of our advertising needs, so we can focus on providing great service to our customers. I would like to say that I enjoy the articles and ads in your magazine. I am a native Harford Countian and it’s nice to see information about our county in print. Thank you soooo much for the article! I picked up some magazines and they are terrific.Your thoughtfulness is much appreciated.What a great opportunity for us. Hey Fran! Always glad to support your awesome magazine! I LOVE this publication and look forward to receiving it . . . great articles, they keep us up to date on what’s happening locally . . . Love the ads too . . . keep them coming! A very HUGE thank you for the write up in the May/June issue. As soon as I read it I knew you had captured what Renaissance Skin Care is all about. It was a beautifully written article. I have had many, many nice comments and compliments and I am very grateful. Thank you again Fran and I hope our relationship will continue. I love this little magazine! I have lived in Harford Co. now for 20 years and am learning about so many unique places and people from your magazine that I didn’t know about previously. I just love it and look forward to each new issue. Keep up the wonderful work! Thanks. 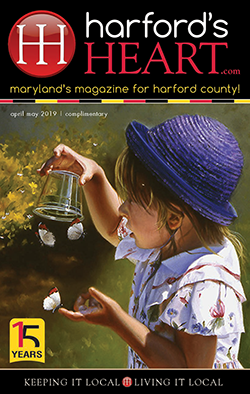 I wanted to let you know I picked up a copy of the new Harford’s Heart issue while in Havre de Grace last weekend and was very pleased and impressed. I’ve been collecting and accumulating as many of the free locally distributed publications that I can find (or that end up in my mailbox) and I sat down with them all the other day to compare and contrast what they offer. Harford’s Heart was tops nearly across the board – in terms of design, quality of printing/paper, quality and amount of content, usefulness, etc. I just moved to Harford County and it was great to find such a great publication. I did not know there was so much to see and do in Harford County. You have done such a good job at laying out what this county has to offer. Thank you so much.